ANNA-LEENA HARKONEN, a famous writer and actor from Finland, second from left, visited created quite a stir when she visited Centara Grand Beach Resort Phuket, where she was welcomed by Denis Thouvard, left, the resort’s general manager, Fongfa Edjongdee, sales manager, and Christiophe Gestin, director of food and beverage at Cenara Phuket. 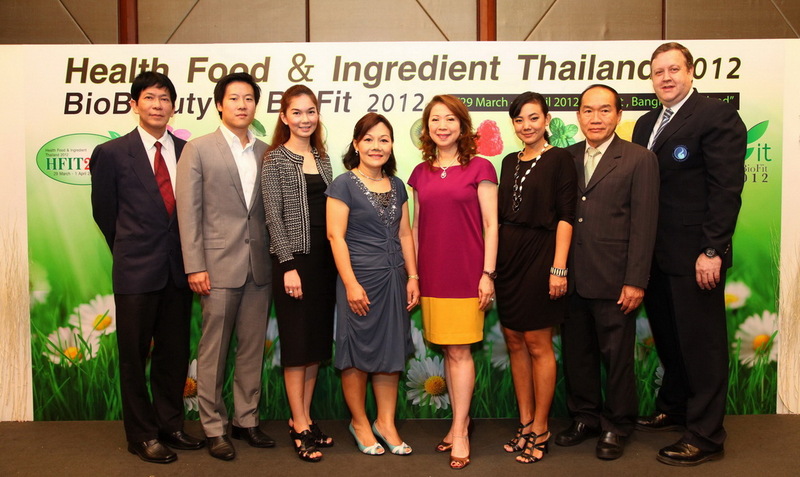 THE SECOND ASEAN INTERNATIONAL EXHIBITION of Health Food Ingredient Thailand (HFIT) and BioBeauty and BioFit (BeFit) will be held at Impact Muangthong, Bangkok, from March 29-April 1. The four-day show is being organized jointly by the Food Industry Network, with ASEAN Trade Promotion Association, Thailand Convention and Exhibition Bureau, Federation of Thai Industries, Thailand Spa Association, Anti Aging & Rejuvenating Center and the cooperation of ASEAN Cosmetics Association, ASEAN Alliance of Traditional Medicine Industries (AATMI), Chamber of Herbal Industries of the Philippines, Inc., Cosmetic, Toiletry and Fragrance Association of Singapore (CTFAS) and Indonesian Cosmetics Association. The organizers have brought together products, businesses and services that are health related into a single event, representing a significant gathering forThailandand ASEAN. Statistics show that ASEAN is the source for quality raw material because of the area’s natural biodiversity – leading to large variety of herbal and phytochemicals production. ASEAN also abounds in age-old traditional wisdom about the uses and applications of these natural products for health and beauty, and for wellness, creating an opportunity for ASEAN to become one the most comprehensive health and beauty and wellness centres in the world, with an abundant base of knowledge in relaxation, anti aging and longevity. That includes the Miracle Foods Zone, which features the foods regarded as 10 Super Foods. These include pomegranate, several types of berries, Koji berry and some Thai fruits. Then there are the Super Grains which offer great health benefits and even advice on how to manage necessary vitamins and food supplements. InThailand, the fast growth items are tea drinks, with an estimated market of 9.1 billion baht, followed by functional drinks at 4 billion baht in 2011. In 2012, new segments are expected to develop in the areas of drinks for healthy skin as well as for male sexual potency drinks. In addition to Health Food and Ingredient, HFIT & BeFit exhibits offer products and services promoting beauty, health and well-being in the forms of spa, esthetic, holistic, anti-aging and rejuvenation promotion centres. “HFIT & BeFit are a great addition to the show because of the large number of visitors looking for products and wellness-based services and resources”. HFIT & BeFit show will be reserved for business visitors on March 29 and 30, open to the general public on March 31 and April 1.
Business visitors will have the opportunity to do business matching and update knowledge on trends of food supplements in Thailand and worldwide from the president of Health Food and Supplement Association of Thailand as well as on spa management and trends and on use of herbal products in spas by the Thai Spa Association. Other areas of interest include the latest information on products to retard aging and rejuvenate health plus an update on the ASEAN natural cosmetics,Singapore cosmetics market, development in Indonesian natural cosmetics regulation, etc. For futher information: www.hfitexpo.com, www.biobeautyshow.com. CENTARA HOTELS and Resorts has opened another hotel in Pattaya, its third in the city. A fourth is currently under construction. The latest addition, called Centara Pattaya Hotel, is located in central Pattaya, a few minutes walk from the beach, and offers 152 rooms and suites. The hotel’s all-day dining restaurant, Mix Bistro, seats 120 guests and offers a comprehensive à la carte menu that combines international cuisines and authentic Thai flavors at a buffet breakfast served indoors or by the terrance overlooking the swimming pool. Centara Hotels and Resorts isThailand’s largest hotel operator, with 38 deluxe and first-class properties covering all major tourist destinations in the country. RENAISSANCE BANGKOK RATCHAPRASON is offering an exclusive Escape spa experience that includes a massage of your choice of an aroma fusion massage or a deep renewal massage or a Thai massage at its roof top Quan Spa while taking in Bangkok’s skyline at sunset. The offer is valid until March 31 and the cost – 7,100-10,500 BHT per night. Advance reservations and a minimum stay of three nights are required. In the case of online reservations, be sure that the promotional code SPA appears in the corporate/promotional code box. For more information/reservations – 0-2125-5000 or visit www.renaissancebangkok.com. Spa Cenvaree at Centara Grand Beach Resort Phuket is offering a Love Spell package to mark Valentine’s Day during the month of February. The package offers a choice between Spice me up citrus milky bath and a Dead Sea with caramel mud wrap, Botanical bliss flower scrub and Vanilla shea butter full-body massage. Cost of the 2.5-hour package – 2,895 BHT per person or 5,790 BHT for a couple. IF YOU’RE IN THE MOOD for something really different, check out what Pullman Bangkok King Power’s Wine Pub is offering – a Spanish maize tree, where you can sample 18 different types of maze. 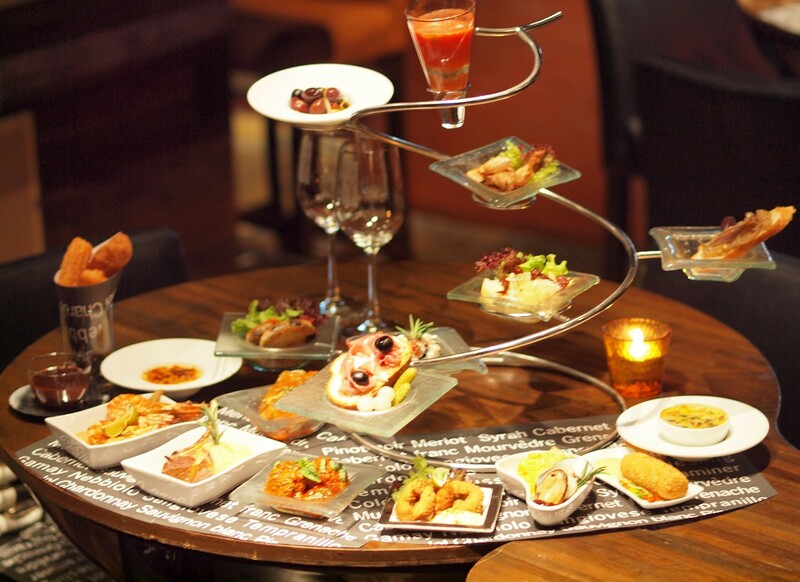 The menu includes marinated feta cheese, Serrano ham, sticky BBQ ribs and more. The cost – 999BHT – until March 31. Pullman has four restaurants: Déja Vu, which features a wine bar and up-market brasserie as well as Asian, Californian and Mediterranean cuisine. Cuisine Unplugged, an open kitchen concept offering noodles, sushi counter, pizza and a bakery corner as well as breakfast, lunch and dinner buffets; Chaan, which focuses on authentic traditional Thai dishes and other Asian cuisine; and Delice, for deserts. JW MARRIOTT KHAO LAK Resort & Spa is offering a Love Indulgence Valentine Getaway Package during the month of February. The two-hour package includes your choice of body scrub, a romantic milk bath (served with a glass of sparkling wine) and an aroma fusion massage. Cost per couple – 6,500 BHT. For more information: 076 584 888 or visit www.marriott.com/hkthl. CENTARA HOTEL and Convention Centre in Udon Thani has opened its newly upgraded Cenvaree Spa, located on the 5th floor next to the hotel pool. It has six treatment rooms and offers a collection of signature rituals based on Thai culture as well as Western therapies. 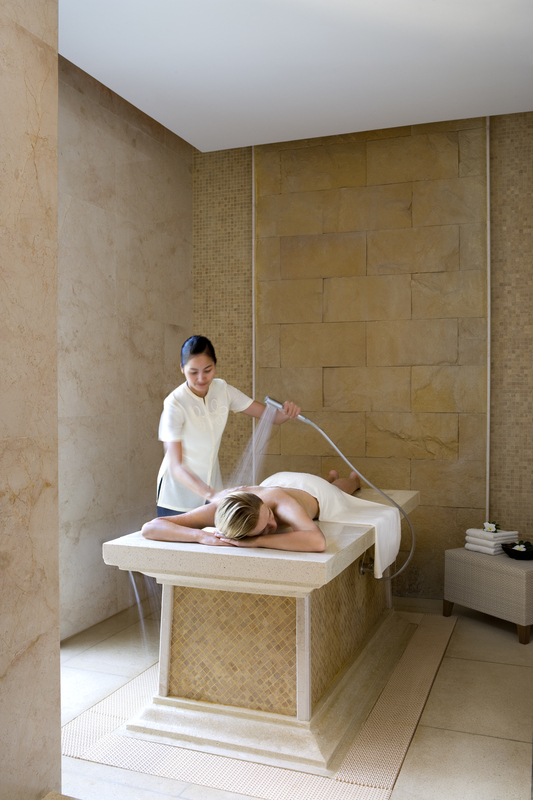 Its signature treatments include Cenvaree’s Samunprai Experience Salt Relief, which combines a blend of Thai and local techniques using a salt compress and massage that harmonize the body’s energies. 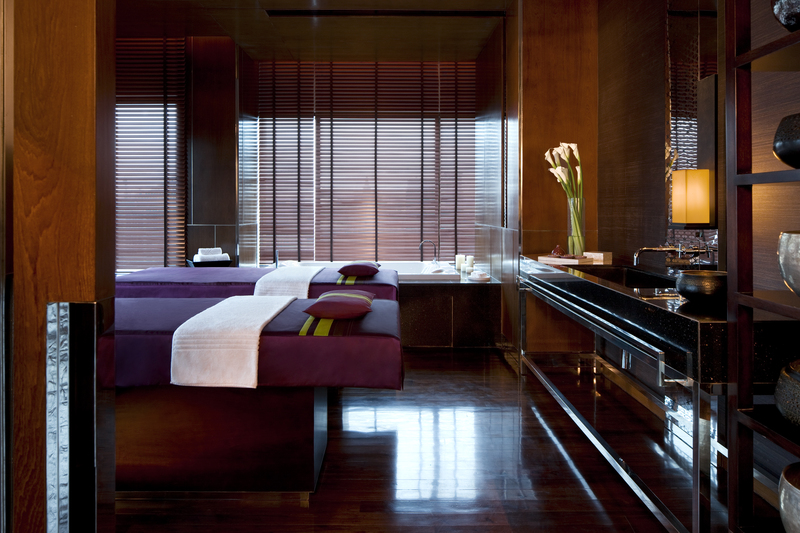 Other treatments include anti-aging facials, traditional massages, a hot stone massage and foot reflexology. Its water treatments focus on Chakra balancing. Centara Hotel and Convention Centre is set within the centre of Udon Thani, one of the great commercial and tourism centres of Northeast Thailand and the gateway toLaosandNorthern Vietnam. The hotel is an integral part of the Central Plaza Udon Thani, the city’s largest. Spa Cenvaree is Centara’s own five-star brand, placing “great emphasis on the innate wisdom of the body” and blending the finest elements of native herbs with massage therapies. ANANTARA LAWANA Koh Samui Resort & Spa is offering a 150-minute detoxifying spa package to kick off the new year that includes a 60-minute body detox massage, a 60-minutre detoxifying green tea body wrap and a 30-minute detoxifying green tea body scrub. The detox package is available until Jan. 31, 2012. Prices start at $144. For more info: call 66-7796-0333 or visit www.lawana-chaweng.anantara.com. Anantara Lawana is also offering a 30% discount on deluxe plunge pool rooms on any stays between Jan. 8 and Dec. 20, 2012. To qualify, you must book ahead at least 14 days in advance. IT JUST KEEPS getting better and better for Six Senses Yao Noi Beyond Phuket, which caps a year of new initiatives by being added to the Condé Nast Traveller Gold List as new entry in the magazine’s Best Hotel for Leisure Category. 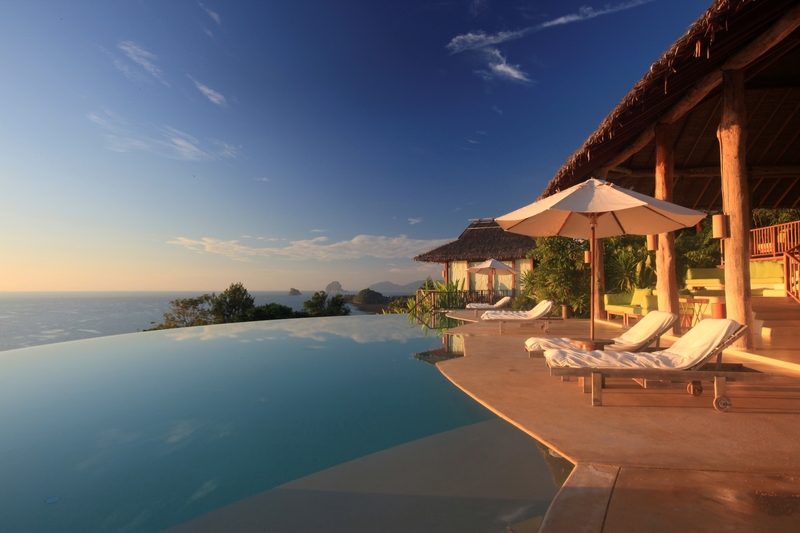 Six Senses Yao Noi has received a number of awards this year. Condé Nast’s Gold List offers readers a guide to the most exclusive, exotic and amazing hotels in the world as chosen by a team of the magazine’s editors, writers and travel experts and judged on the basis of location, food, rooms, leisure facilities or ambience and design. New additions to Six Senses Yao Noi Beyond Phuket in 2011 included opening its Hilltop Reserve as a restaurant and pool area to all guests and introducing three new villa types – The House, a large four-bedroom villa ideal for families; The View, a “perfect romantic hideaway; and The Retreat, now the resort’s most exclusive, especially its Ocean Panorama View Villa. “This all-villa resort on Phang Nga Bay Island of Koh Yao Noi combines luxury and attentive service with environmentally, low-impact design,” said Condé Nast in its announcement. 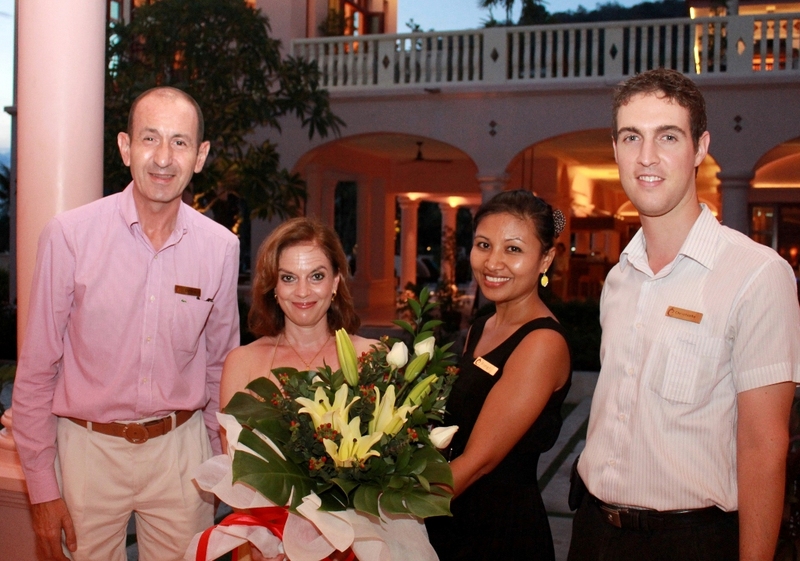 Manish Puri, general manager of Six Senses Yao Noi Beyond Phuket, thanked the people behind the award. 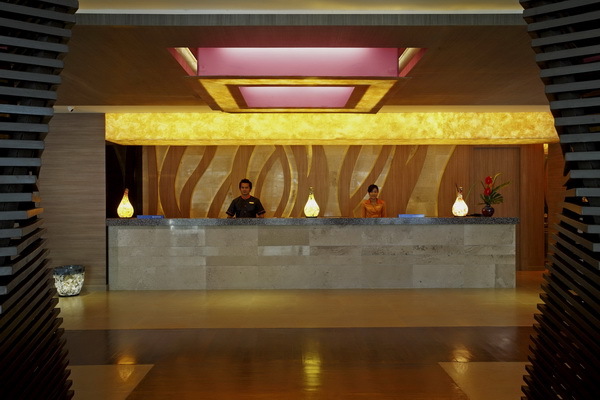 He also noted that the resort’s spa would be introducing a range of new treatments and Puriti Program in 2012.